Right-wing media are naturally having a field day over Neil Munro (not the Scottish writer and critic, but the person affiliated with the conservative website The Daily Caller who recently interrupted President Obama to shout questions about the president’s immigration policy). This part is really rich: What he shouted was something like, “Why do you favor foreigners over American workers?” [which is not only a loaded question, but one that sounds more like a provocation or a taunt than a question to which he seeks a real answer]. Turns out, Munro himself is a “foreigner” (born in Ireland) who is therefore enjoying a job that could be filled by an American. The right-wing media say Bully for him! and take delight in anyone who disrespects this president (but god help anyone who disrespects the office, the flag, etc.). 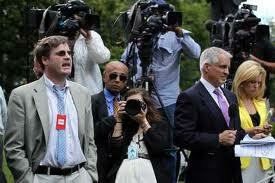 They say the rest of the media are a bunch of lapdogs who spend all day bowing down to the president. I am actually of two minds about this one. My ambivalence is based on my experience. For a couple of years, I regularly took part in the state-level equivalent of the Rose Garden event. In fact, as the AP’s bureau chief, I usually asked the first question at the governor’s press conferences in Boston. In that setting, pretty much everyone is a professional who is there to work. The chief executive has a message to convey, and reporters have questions to which they really need answers. Generally, there are ground rules that ensure that the working press can actually get its work done. Generally, those ground rules exclude grandstanding, taunting, heckling, and the rest, because those kind of activities are inimical to Q+A. I have no objection to those activities, per se. I think our leaders need a good heckling from time to time. I just don’t see where this guy gets off breaking the ground rules and then acting as if he’s the injured party. There are reporters working at the White House who do not want to have to explain to their bosses that the reason they don’t have a story is that some bozo decided to turn the event into a shouting match. If you want to heckle the president, go to a public event. If you need to ask him a question, go to a press conference.